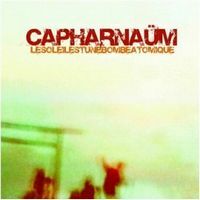 While the name Capharnaüm would seem a unique name for a band, there are in fact 3 bands of the same name (including this one), although only one more shares that Umlaut above the A. The other two bands, though, are metal bands (one is playing progressive music), and this current one, is playing another kind of rock. This band is currently signed to Unicorn Digital, who have other excellent bands signed, such as The Gourishankar, Hamadryad, Nil, Karcius, Karfagen, Sympozion and other very talented bands. Capharnaüm is no exception. The band sounds tight and as if they have been playing for a long time together, and indeed they have been active for over a decade according to the press release. The band was founded in the Quebec City area in 1991, and they performed a lot. The current lineup has been stable since 1998 and this is their first studio album released. Instrumental rock, what some might call post-rock, but there are no sound textures as in other post rock bands, but with a rather defined musical theme through which the lead guitar is paving the way exploring the grounds. The tracks are wordless songs, but I see it as if the lead guitar does the singing as it is free to go about in each. The sound on this album is tight and well recorded (all instruments are clearly heard). The music is overall, optimistic in nature and even uplifting (but not in a tacky way). The general mood which I get from the band on this album is that of “we feel good, and we want you to feel the same”. However this is not to say there aren’t more emotions expressed in their music. As they say in the French part of the press release, their music portrays both hope and doubt, force and subtlety, explosion (meaning getting aggressions out into the open, showing what they have stored in their mind to the world) and introspection (meaning parts in which the music is more reflective and delicate). The album in general has a dynamic flow to it, there’s no abrupt changes, no stops that cause it to digress. There is musical development in each track; there is high energy and powerful driving force. To accompany that, there is melody, diversity and a sense of fun that the band emits in those tunes. There is a connecting thread of sound throughout the album with variety to keep it interesting. There is variation from track to track, not like some other albums in which it is sometimes hard to differentiate between the individual tracks. All in all, there is a great rhythm to the album, a natural flow from “song” to “song”. That last sentence especially, I think, is a good indication of their intentions and what their music strives to achieve. Their music has all the potential to be much harder, rougher and “dirtier” sounding, but they opt for a rather clean and hopeful musical path. Even when they get heavy (see below) they still retain their original qualities. After the 6th track there are 3 tunes (7,9,10) in which there is experimentation going on. In those the general mood slightly changes, going for a more severe sound but still retaining the essence of the band’s approach. The seventh track deviates a bit with its programmed drumming and the somewhat different sounds they create here, but not too much as to make it alienating. This track is more meant to create dynamic sound textures and leave for now the “singer” (lead guitar) out of the picture and let the guitars create a good flowing rhythm. This is also the only track with a synth in it (sounding as a piano). A short track, which could have been developed more. Track 9 as well starts with programming but this is soon over and replaced by the band getting on in the same style as the beginning of the album. The end of the album (last 3 tracks, but 8 and 10 especially) is a veer into a heavier, and even more metallic sound (tracks 8, 10). Not the entirety of the tracks is metallic, but at some point in them, the metal riffs take over. However, this is not too heavy a sound, so do not fret. The two last tracks are in fact two standouts in this album. Track 9 flows directly into track 10 which then goes on with much more pronounced metal sounding riffs and even guitar solo. This is also a somewhat darker sounding side of the band. This is a fitting closer to the album, as this proceeds from part to part, gaining energy and power and coming to several high points (with the guitar solo) and the heavy riffing giving a tone of eminent ending. But just when I thought it was over, it starts with yet more riffs (different melody) and a great bass line and the album ends that way, a bit abruptly but nevertheless fitting. So, we have some dynamic refreshing mostly optimistic sounding instrumental rock, tight playing and one thoroughly enjoyable album. I look forward to hear more from these talented musicians. Recommended.